WE COMMIT OURSELVES TO THE CAUSE OF CREATING INTELLIGENT MACHINES THAT WILL EXPONENTIALLY AUGMENT HUMAN CAPABILITIES. In our journey of building the best AI Assistant Platform, we would like to share with you, all that we know. As most of the business users and leaders are still not clear about how to use AI to transform their current business processes, ‘A.I Literacy Camp’ is an initiative to create A.I awareness among the business leaders. The sole purpose of this platform is to help them plan and lead the A.I journey for their organisation. ‘AI Literacy Camp’ will hold periodic Webinars, Podcasts and Workshops to simplify AI for business transformation. Conducted by Business and Technology Experts from Applicate. Venue – The organisation signing-up for the AI Literacy Camp has to arrange for the venue and logistics. It can be organised in the company conference room or auditorium. How to measure Cost, Investment and ROI of A.I initiatives. NOTE: Applicate reserves the right of selecting and finalising companies or group for the ‘AI Literacy Camp’ based on the nominations interest and nominations received. HR BOT : AN AI HR CHATBOT FOR EMPLOYEE QUERIES, FAQ, TRAINING AND ENGAGEMENT !! HOW A.I WILL HAVE REAL IMPACT ON BUSINESS! ApplicateAI’ is an integrated AI BOT platform for Enterprise with defined and curated work-flows for HR, Sales and Consumer Engagement. Applicate is already working with most of the top Global and Indian brands like Kelloggs, Britannia, ITC, Perfetti, GPI, Nerolac, Dulux, Whirlpool, Crizal and others. 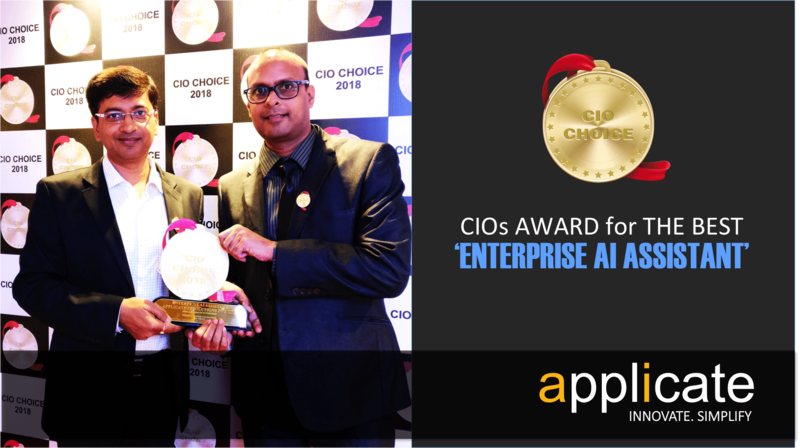 The AI innovation of Applicate has been AWARDED as the ‘Best Enterprise AI Assistant’ by CIO CHOICE based on the voting of leading CIOs. Employee AI Assisatnt ‘MooN‘ has been created by Applicate to assist and empower employees with updates, data, information, policies, compliance, product knowledge, skill gap identification, training inputs, and engagement etc.